The Baltimore State’s Attorney’s Office will no longer prosecute marijuana possession cases, regardless of the amount possessed, State’s Attorney Maryland Mosby announced at a press conference Tuesday. 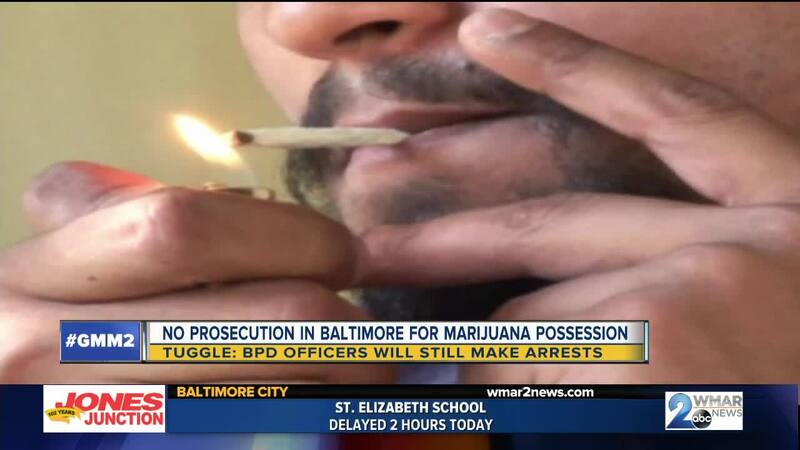 BALTIMORE — The Baltimore State’s Attorney’s Office will no longer prosecute marijuana possession cases, regardless of the amount possessed, State’s Attorney Maryland Mosby announced at a press conference Tuesday. Possession arrests will not be charged regardless of weight or criminal history of the person arrested, Mosby said. Possession with the intent to distribute will only be prosecuted if additional evidence is presented – scales, baggies or other tools of packaging and selling drugs, or officer testimony of witnessing drug sales, etc. First time drug distribution offenders will be referred to the Aim to B’more diversion program rather than incarceration. The program is a three-year probation before judgment course that attempts to help offenders avoid rearrest and add value to their communities through service, job readiness, workforce development, and life skills coaching, according to the State’s Attorney’s website. 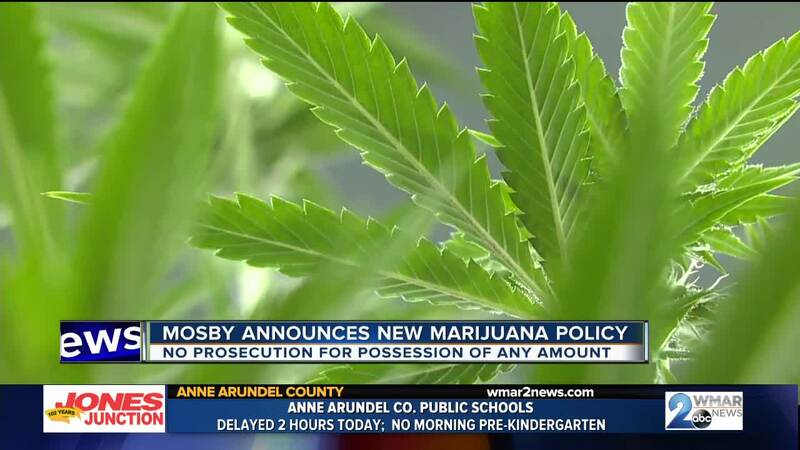 “If someone is arrested for simple marijuana possession, we will release them without charges,” Mosby said. Citing historic trends of disproportionate enforcement on poor and minority communities, current public opinions about marijuana, a better allocation of law enforcement resources, and the incredible burden a marijuana possession arrest presents to future employment and life prospects, thus contributing to economic decline and crime in the city, Mosby joins a growing trend of urban chief prosecutors changing their stance on marijuana prosecution. Mosby cited statistics provided by the American Civil Liberties Union that highlight the steep racial disparity in marijuana prosecutions. In 2010, 58 percent of marijuana possession arrests in Maryland were of black people, yet the black community represented just 30% of the state’s population, according to the ACLU’s stats. Nationally, black people were four-times more likely than white people to be arrested for marijuana possession that year, whereas black people were six times more likely to face a possession arrest than their white counterparts in Baltimore City. The move to decriminalize possession of fewer than 10 grams did not change the disproportionate patterns, according to the ACLU’s data. In 2015, 85 percent of civil citations for marijuana possession were given to black people in Baltimore, Mosby said, ticking up to 94 percent in 2016, and 95 percent in 2017. Baltimore’s population is roughly 60 percent black. “Even though white and black residents use marijuana at roughly the same rates, marijuana arrests continued to be disproportionately enforced on people of color in this city,” Mosby said. In a city frequently debating the vast budget allocation to the police department, and the frequent reliance on overtime usage largely due to a lack of recruiting and staffing enough officers, all while the population continues to suffer from historic violent crime trends, Mosby’s office made the case that law enforcement should not be spending time and resources on marijuana arrests and prosecution. She also tied the disproportionate enforcement of such laws on minority and poor communities to the deterioration of the relationship between city residents and the police. “Law enforcement pays a steep cost in the form of public trust when we spend resources on jailing people for marijuana yet simultaneously fail to solve and successfully prosecute homicides,” Mosby said. The city suffered 343 murders in 2017, with a clearance rate of 34 percent, Mosby said. In 2018, murders fell to 3016, but the clearance rate also dipped to 26%. We need to commit our full efforts and resources to get violent criminals off our streets. It's important that we look at common sense approaches to laws governing personal possession of marijuana, as cities across the nation have done on the East and West Coasts, including New York, Philadelphia, St.Louis and Reno. I am supportive of what State’s Attorney Marilyn Mosby is attempting to address, namely the unnecessary criminalization of those who possess marijuana merely for personal use. But at the same time, we also need to understand that those who deal illegal substances fuel criminality in our neighborhoods which leads to violence. We cannot, nor will we, let-up in our efforts to eliminate violent crime at its source. I want to urge our legislative colleagues to look carefully at these issues and at best practices underway elsewhere, in collaboration with the State’s Attorney and law enforcement leadership to determine an approach that is unified, consistent in its application and in the best interests of our communities.